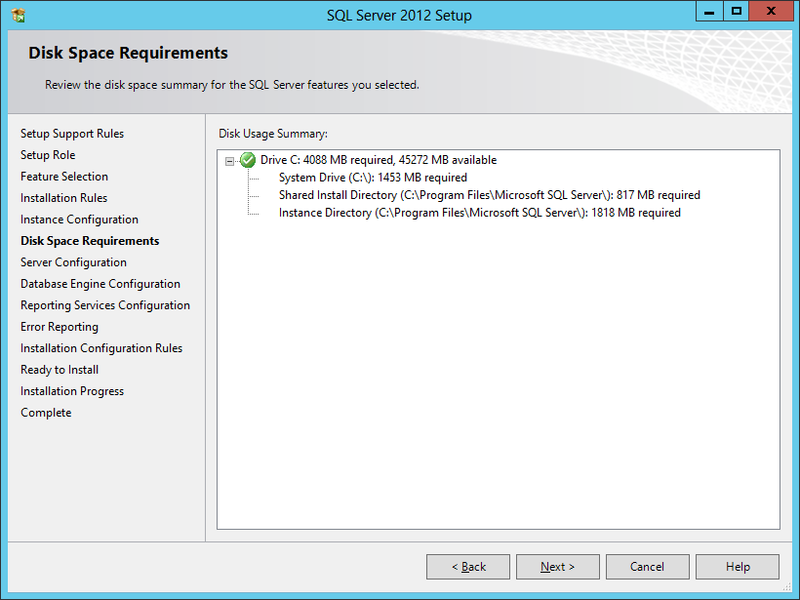 For product specific SQL requirements, please see the SQL Server Features page. At this point, since we will be installing SQL Server on the same server that we will be installing System Center, it is expected that you have the VM created, the OS is installed, the appropriate networking has been configured, and it is joined to your lab domain. 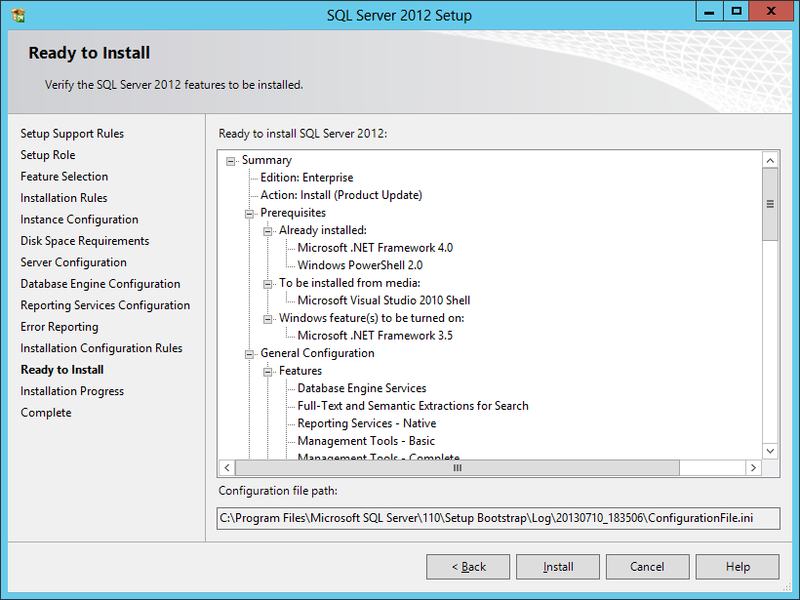 To avoid a specific installation error (see the end of the Install SQL Server section), you have to install the .NET Framework 3.5. So we’re going to complete this first before we start the installation of SQL. 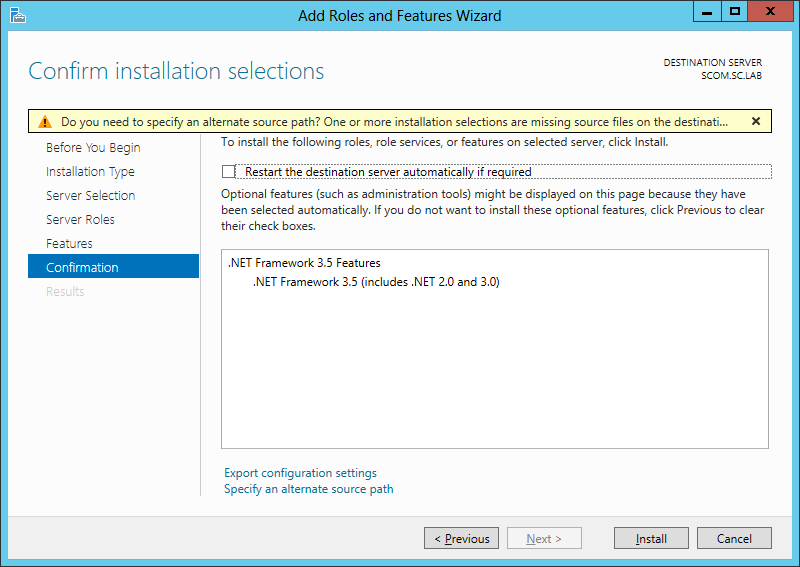 To install the specific version of .NET that we require (version 3.5 in this case), start by launching the Server Manager, and selecting Manager > Add Roles and Features. 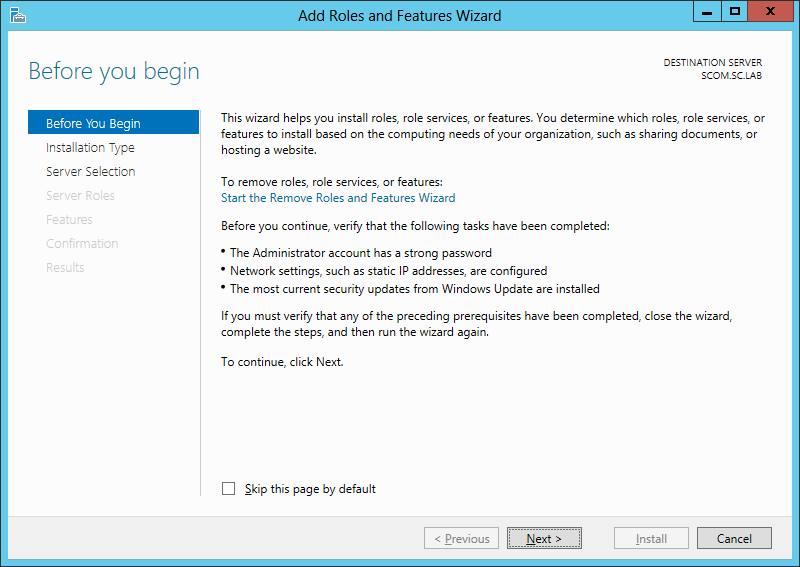 On the Add Roles and Features Wizard, read the information on the Before You Begin screen, and then click Next. 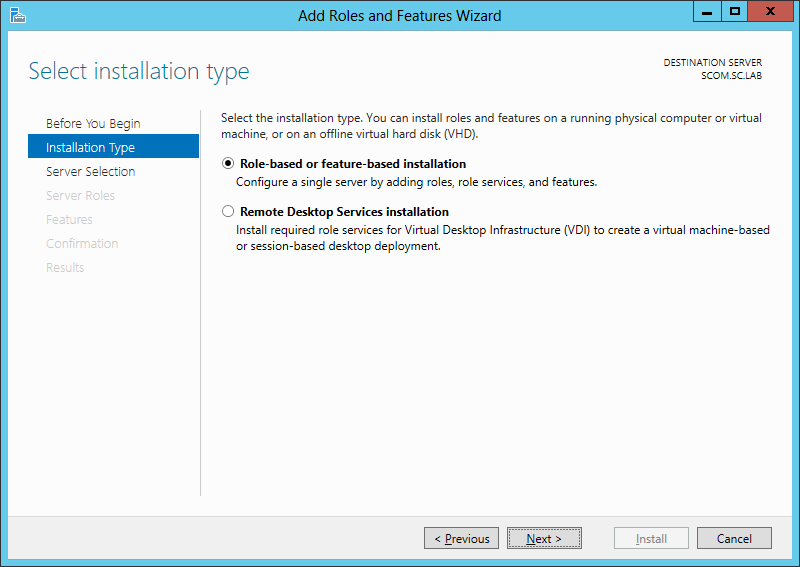 On the Installation Type screen, select ‘Role-based or feature-based installation’, and click Next. 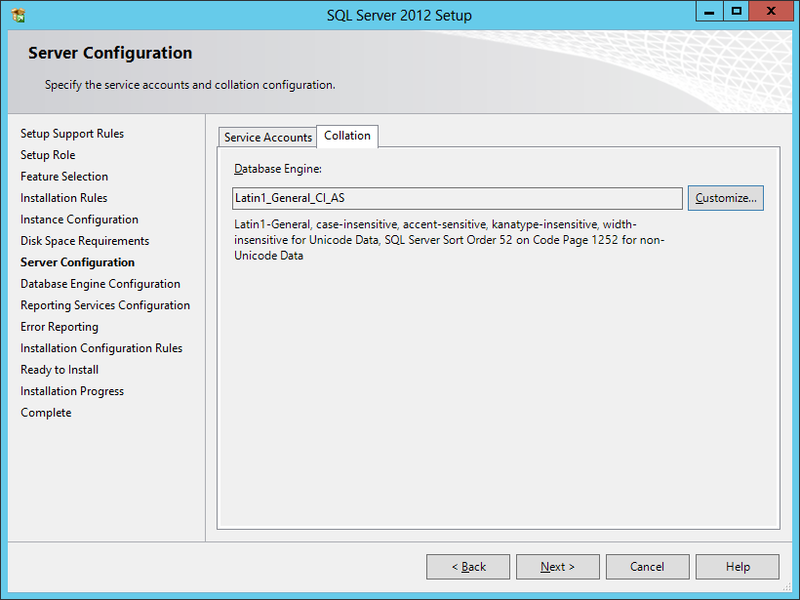 On the Server Selection screen, since we are installing SQL on the same server as SCOM, ensure that it is selected, and then click Next. On the Server Roles screen, we are not installing a Role, but rather a Feature, so just click Next. 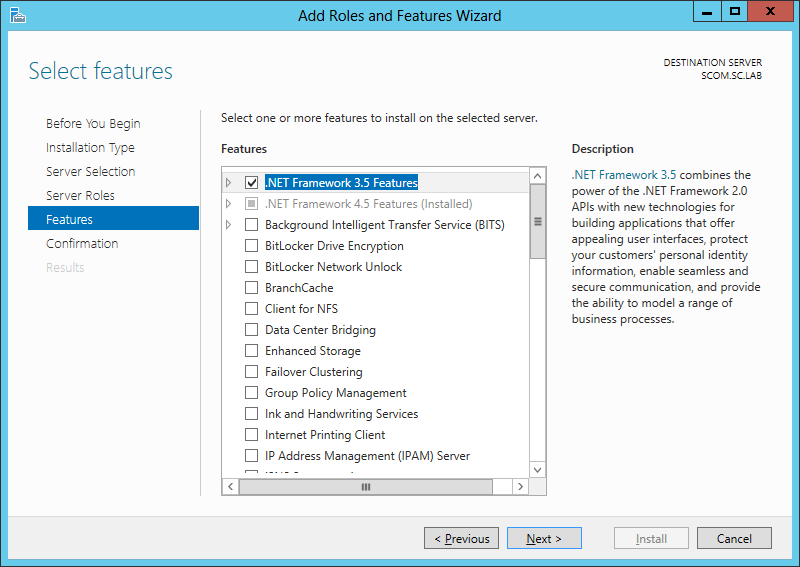 On the Features screen, select .NET Framework 3.5 Features, and click Next. 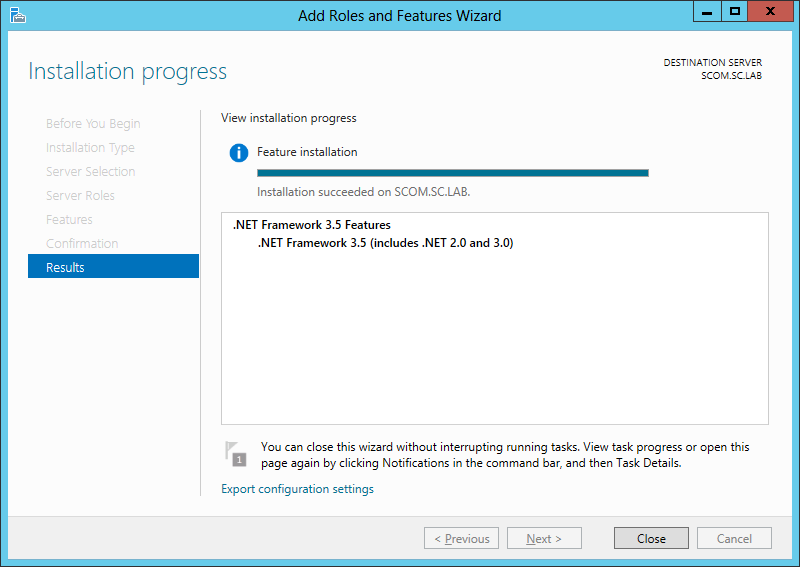 Since in Windows Server 2012 the .NET Framework 4.x is the main framework, the OS installation does not contain the source files for this installation. 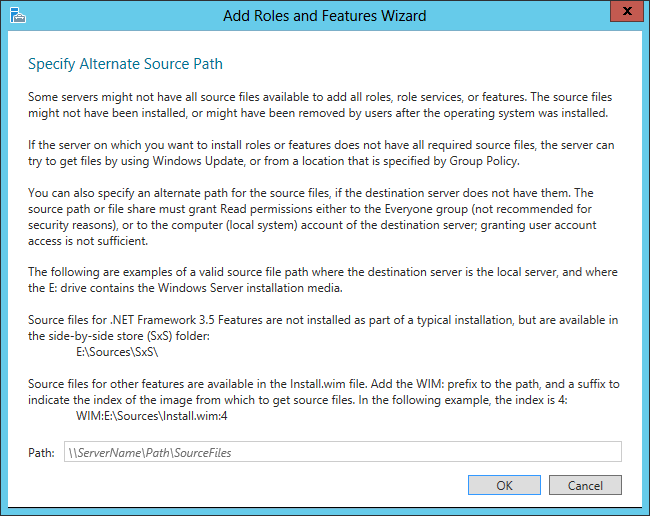 Therefore, you will need to click on the ‘Specify an alternate source path’ link at the bottom of the dialog. You will need to provide the path to where the source files are. This is found within the installation media of Windows Server 2012. If you insert a DVD or mount an ISO, specify the path to the SxS folder (i.e. D:SourcesSxS), and then press OK.
Click Install, and once it has completed, click Close. 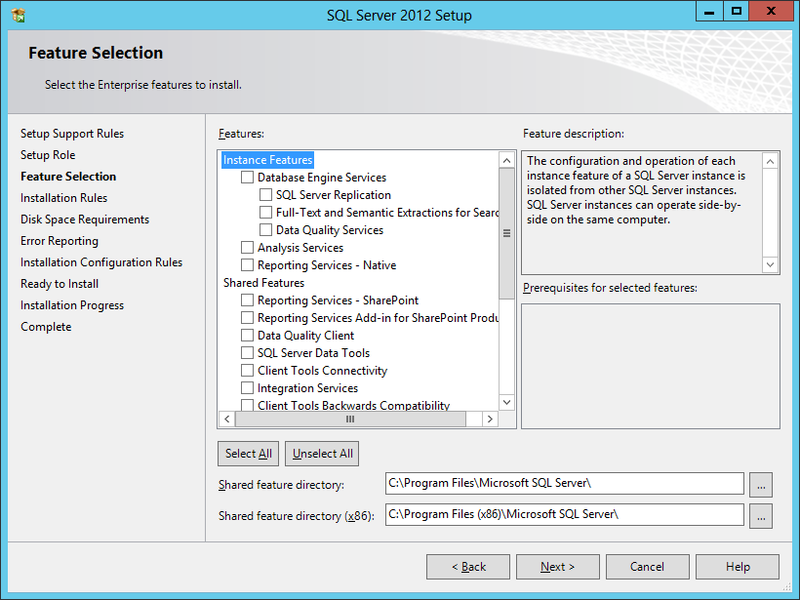 Start by either extracting or mounting the SQL Server ISO, and run the setup.exe. 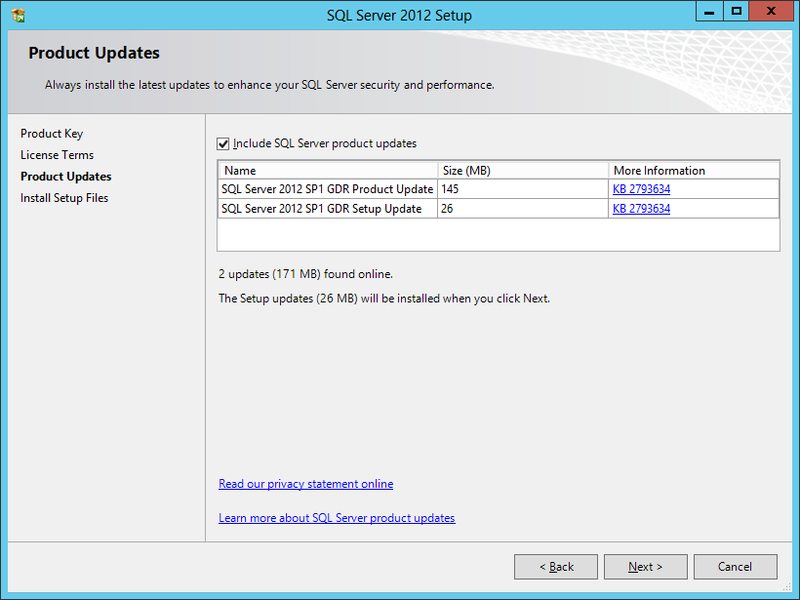 In this example, we are installing SQL Server 2012 SP1. On the main installation screen, click on the Installation link on the left pane. 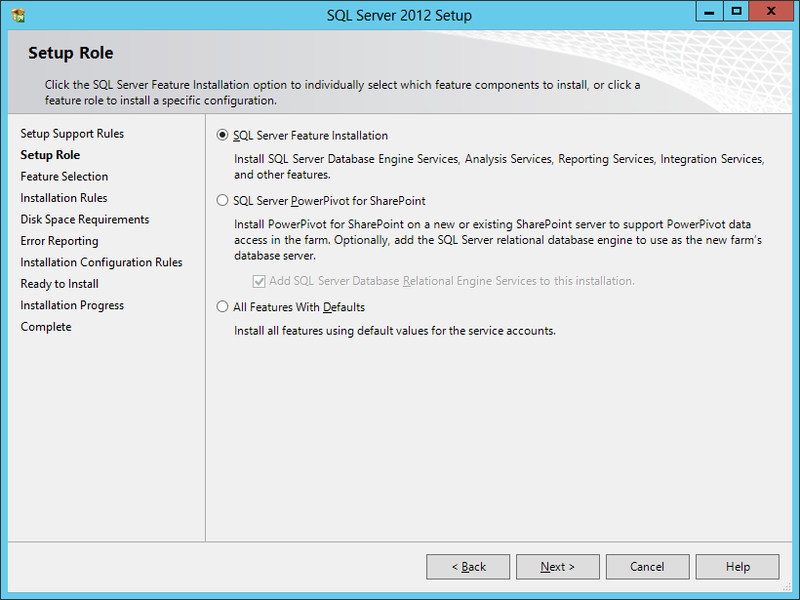 From the Installation screen, click the ‘New SQL Server stand-along installation or add features to an existing installation’ link. This is initiate the installation. 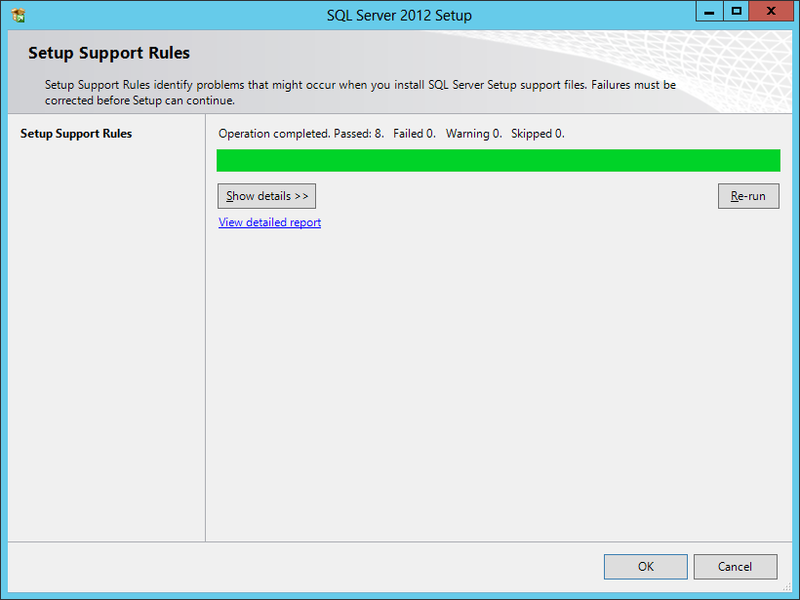 First, the Setup Support Rules will check for any issues. As long as there isn’t any ‘Failed’ issues, click OK to continue with the installation. 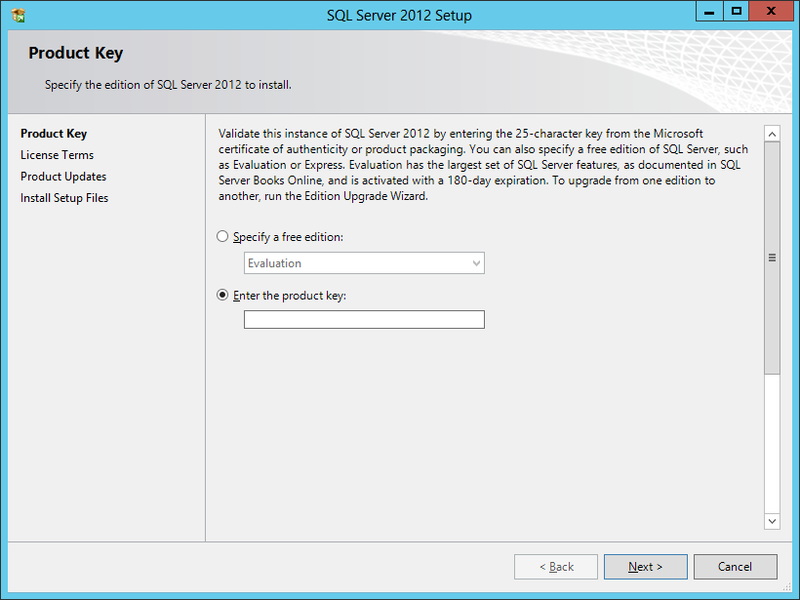 Next, enter your product key or select the evaluation copy to install, and press Next. 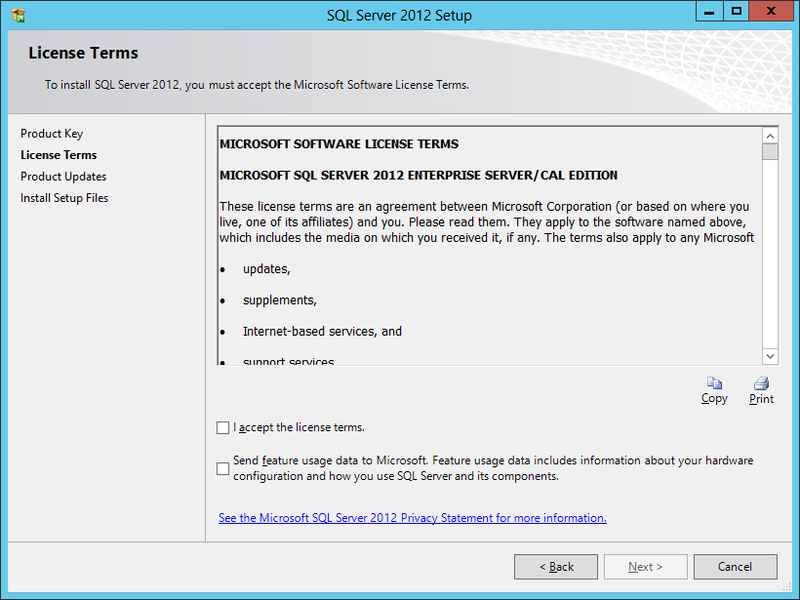 Accept the License Terms and choose if you will send usage data to Microsoft, then press Next. If you have an Internet connection, the installer will check if there are any applicable updates to the installation, and will download the updates to use during the install. Click Next. The Setup will perform another Setup Support Rules check. As long as there are no Failures, you can click Next. Next is the Setup Role. For our needs, we will choose ‘SQL Server Feature Installation’, then press Next. For the Feature Selection, select the applicable features to install. As a minimum, you will probably need the Database Engine Services (for the database), and the Management Tools – Basic and Complete (to be able to configure SQL). If your specific System Center product has a reporting element, then you will also need the Reporting Services – Native feature. 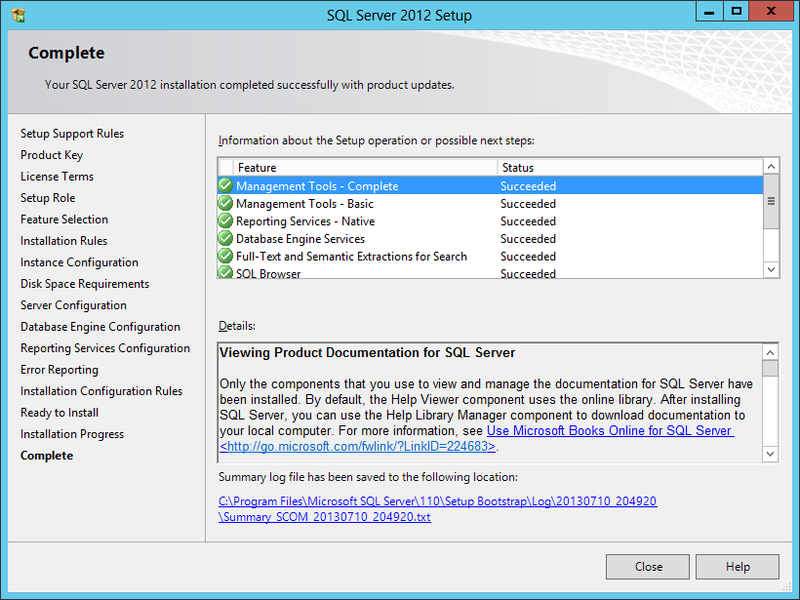 Check the products documentation for specific SQL Server requirements, make the applicable selections, and then press Next. 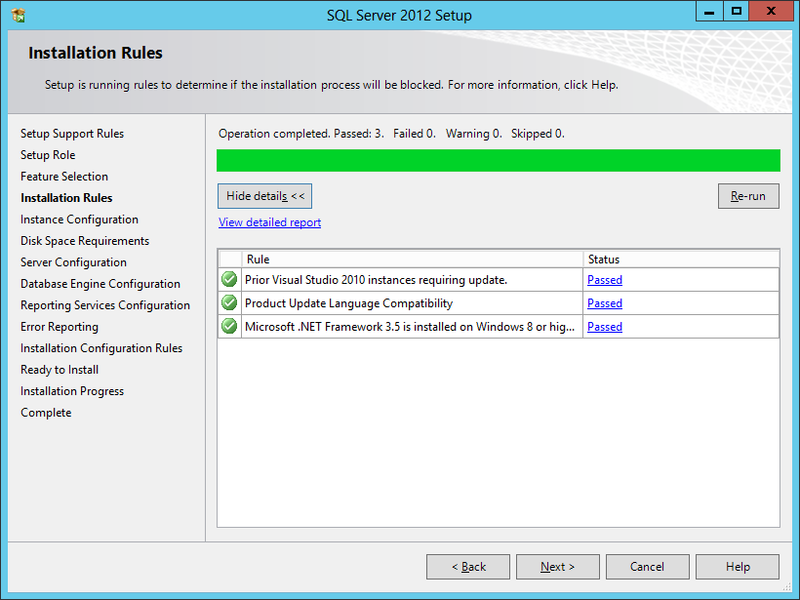 The Installation Rules will run to determine if anything will block the SQL installation. If there are no Failures, click Next. Next we will configure the instance. You can choose either to use a Default instance, or a Named instance. 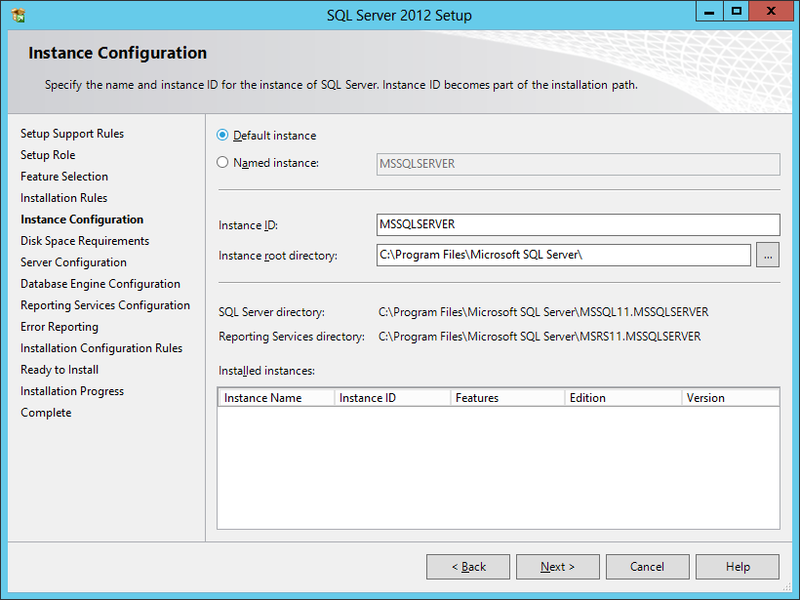 In this example, I will use a named instance, so as to not get this installation of SQL mixed up with any other I will have in my lab. Make your applicable choice, and click Next. The setup will check and confirm there is enough space on the drive for the installation. If everything is reported as OK, click Next. 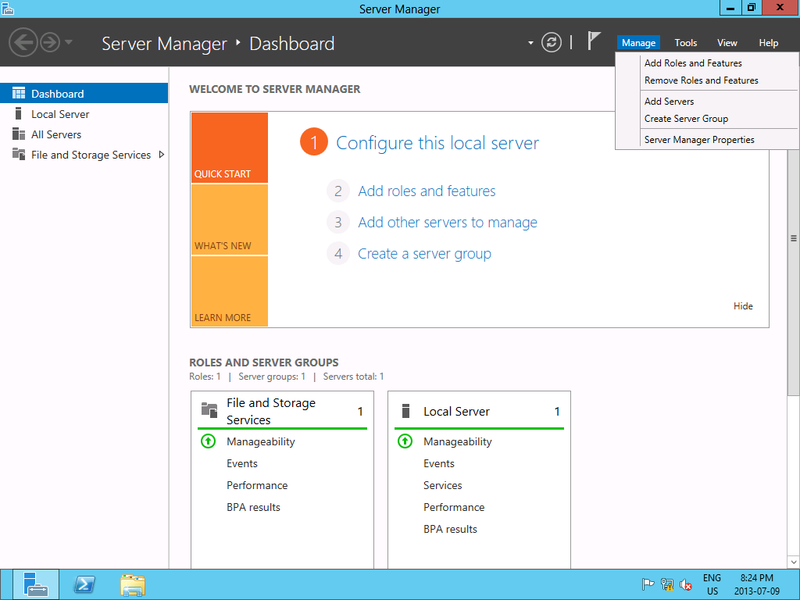 You next have to configure the server, which includes the Service Accounts and Collation. In Production, it is best practice to have a separate account for each of the services. In our lab, we will leave everything at defaults, with the exception of changing the ‘SQL Server Agent’ startup type from ‘Manual’ to ‘Automatic’. After you have completed this, don’t click Next, but rather click on the Collation tab. On the Collation tab, you will need to click the Customize button to be able to change it appropriately. 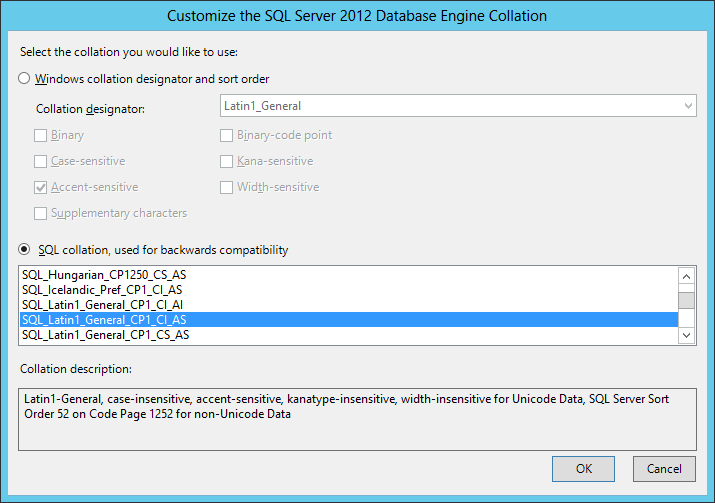 On the Customize dialog, select ‘SQL collation, used for backwards compatibility’. 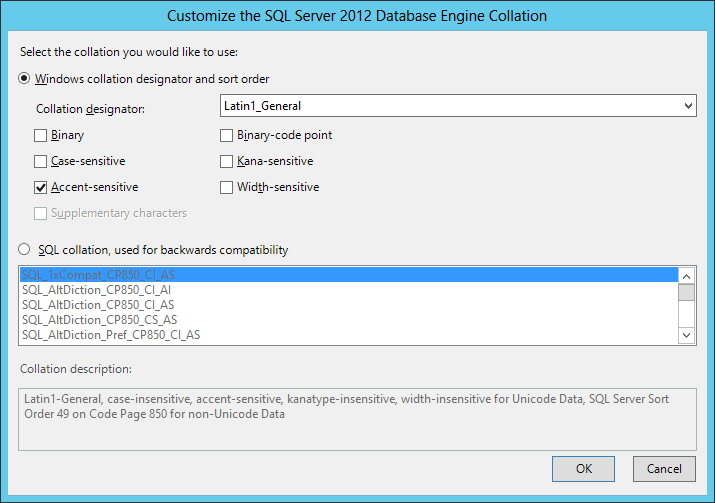 Within the list, find ‘SQL_Latin1_General_CP1_CI_AS’ and select it, then click OK.
You will be back on the Server Configuration dialog, click Next. 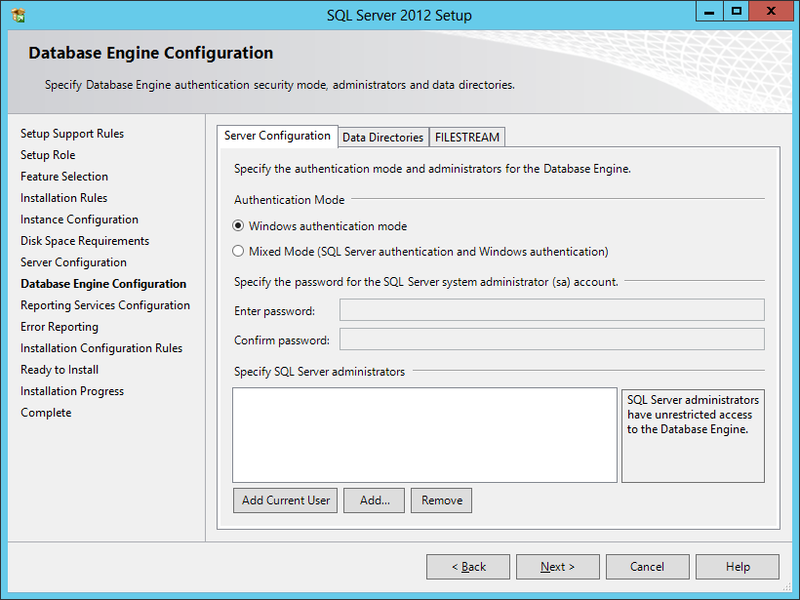 On the Database Engine Configuration screen, leave the Authentication Mode at ‘Windows authentication mode’. 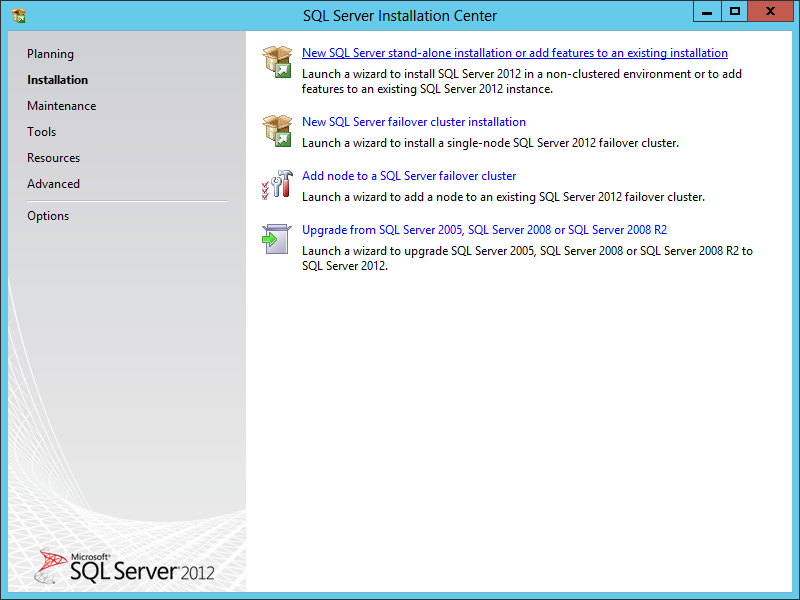 What do have to change is to add SQL Server Administrators. Click the Add button. 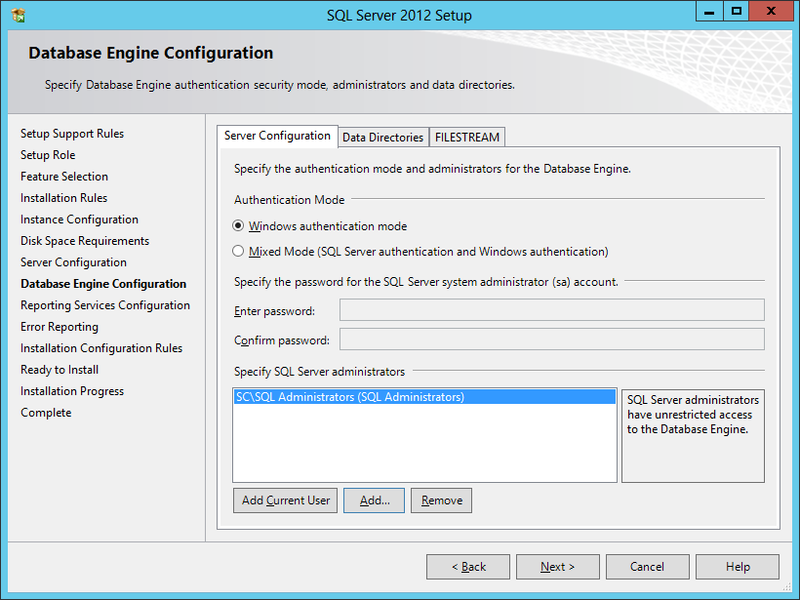 On the next dialog, you will need to add either the user(s) or security group(s) you want to have administrator access to SQL. 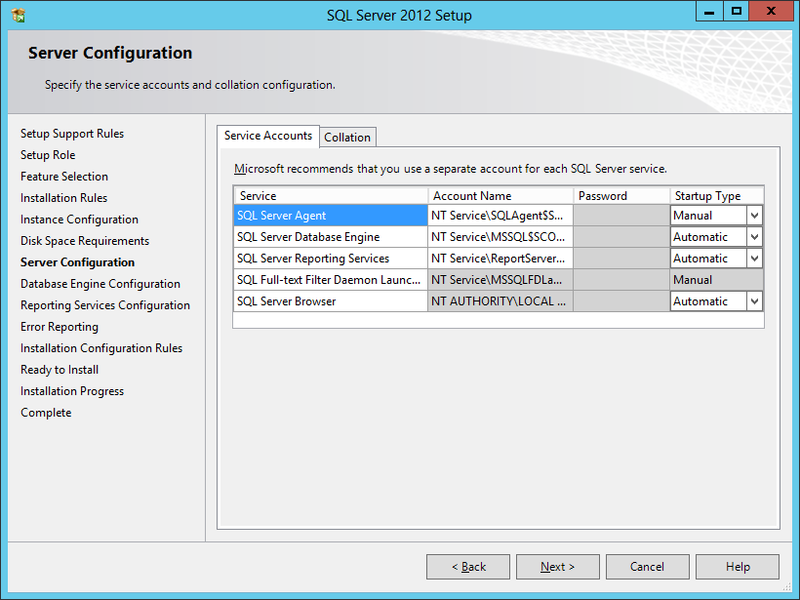 At a bare minimum, add the current user account, so that you can log into SQL Server. Add the user(s)/security group(s), and click OK.
You will be back on the Database Engine Configuration screen, and your accounts will now be present. 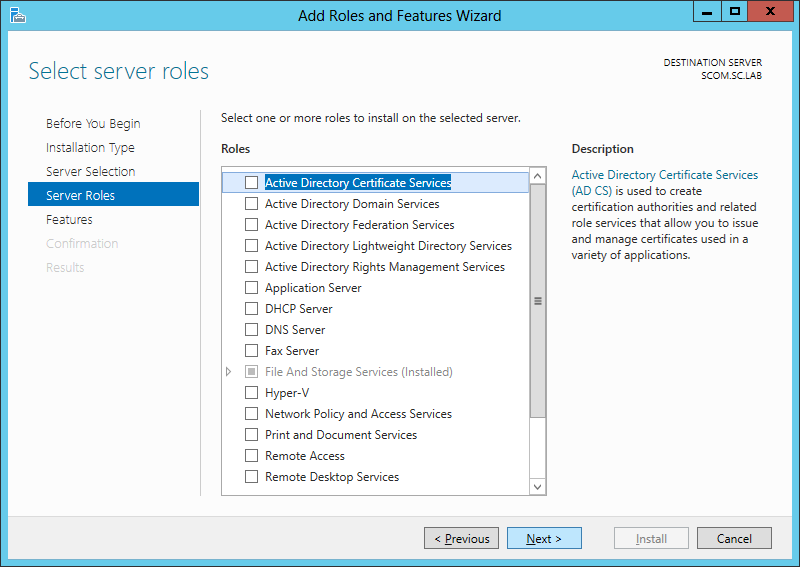 In my example, I have an Active Directory Security Group I specifically created for SQL Administrators. Then click Next. 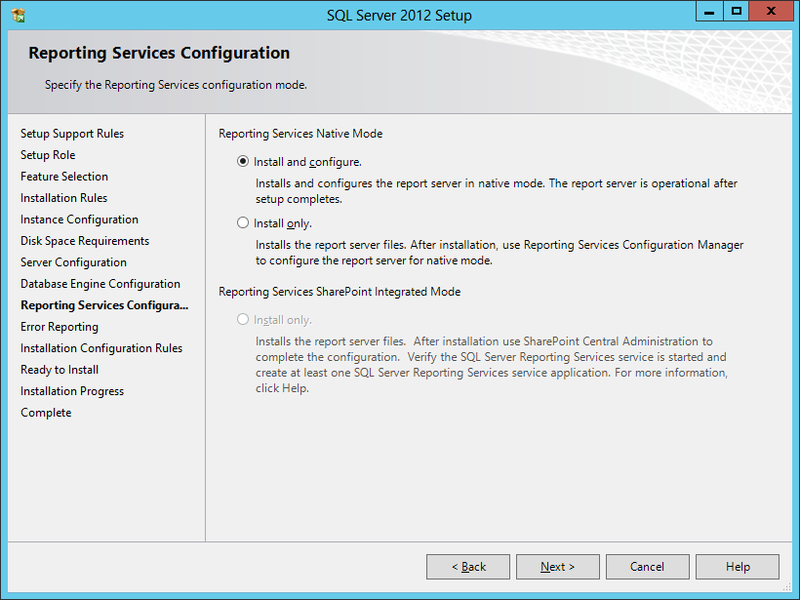 Since we checked off Reporting Services, we are now presented with its configuration. 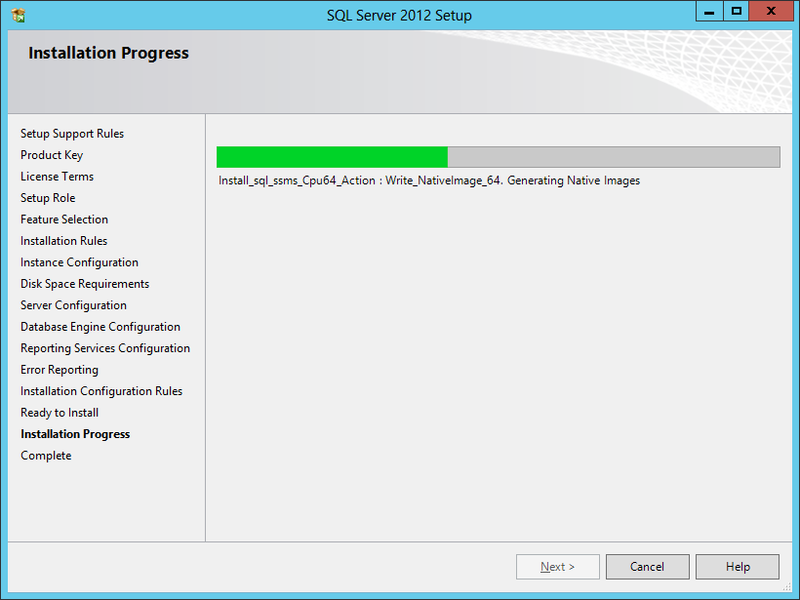 Leave the default ‘Install and configure’ option selected, and click Next. You can choose to send Error Reporting information to Microsoft. Make your choice, and click Next. 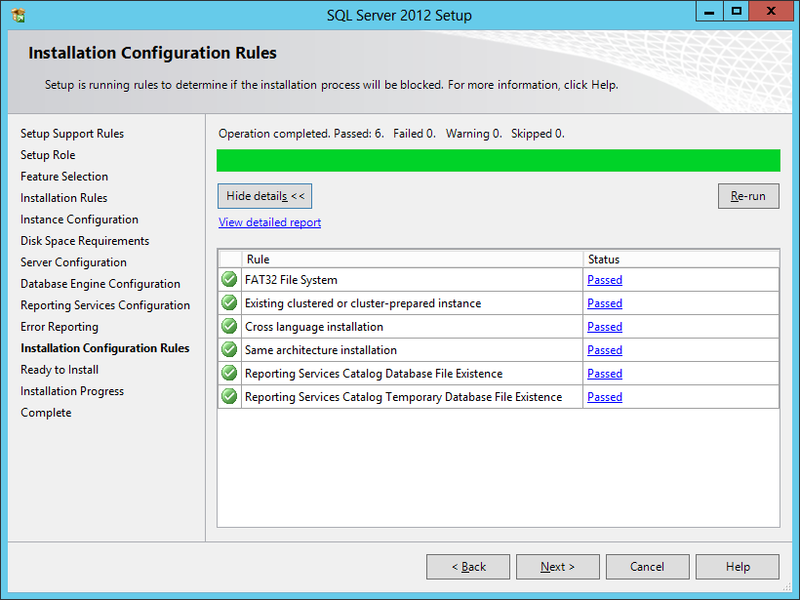 The setup will now re-check the configuration rules, based on the selections and information that has been supplied. If it passes, click Next. Review the information on the Ready To Install screen, and then click Install. Note: during the installation, you may encounter the following error message. 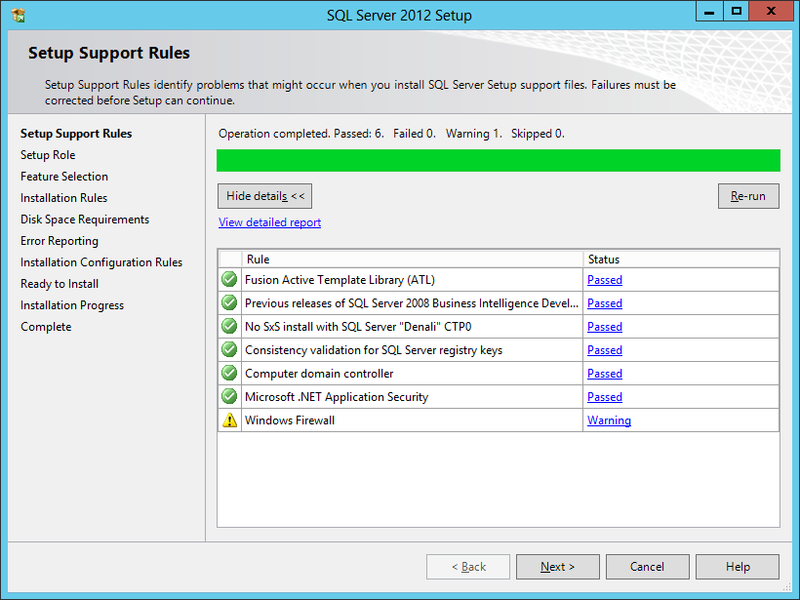 This is due to not having the .NET Framework 3.5 installed prior to attempting to install SQL Server. If you encounter this, cancel the SQL server installation, and install the .NET Framework 3.5 (which is an available feature within Roles and Features). You may have to wait a while for the Installation Progress to complete. On the Complete screen, click Close. 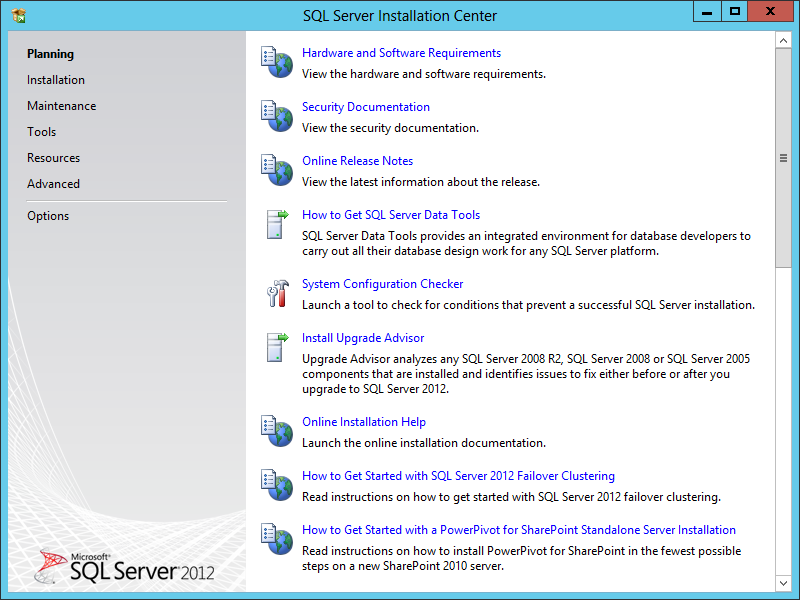 Congratulations, you now have SQL Server installed and are finally ready to install System Center. 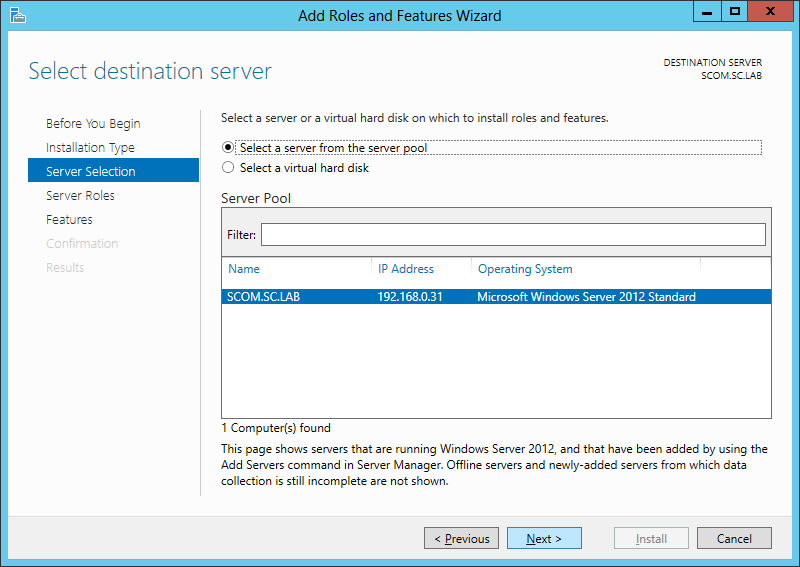 Did you install SQL in AD server or SCOM server? 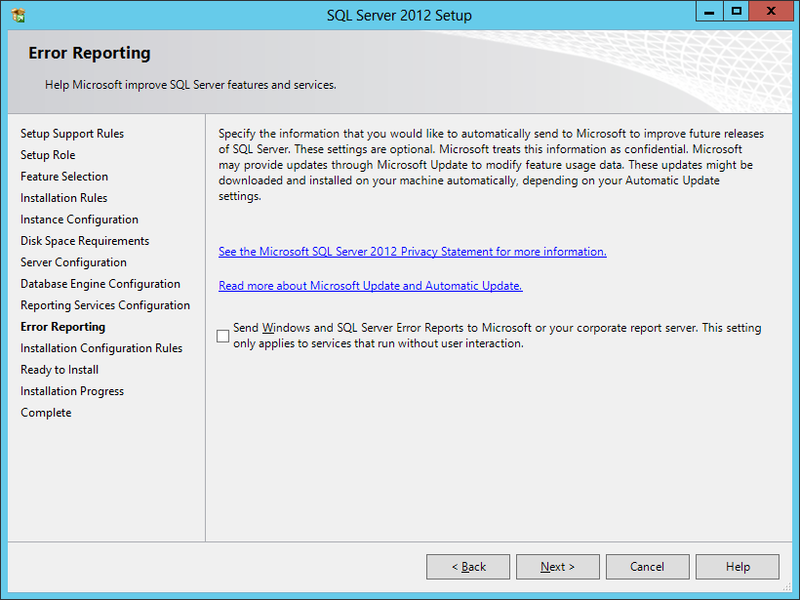 I installed SQL Server either on the same server as SCOM, or you could also setup a dedicated SQL Server.